I'm not sure if that's a thing, but maybe Fridays could be the new fatty-Friday/foodie Friday, and I'll post pics solely of food (Although I'm pretty sure that's the #1 thing I instagram the most lol.). I've been so busy with my son finally ending the school year, and trying to get my youngest son's hardship transfer done (I may write up a post on Autism in Louisville, entering school etc. *so* much to do, and can be difficult if you don't know the resources available.) that I haven't had much time to do much else! Hopefully with the stress out of the way, I'll be able to do new and exciting stuff around here! Stress (aka Binge Eating), led me to waltz into World Market to grab some goodies. 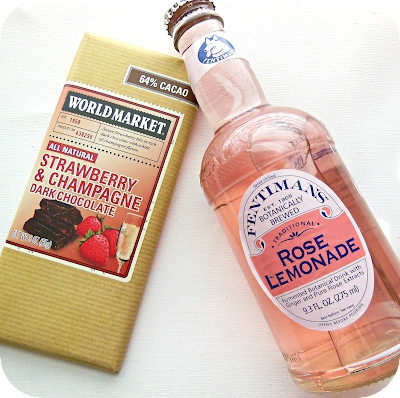 The chocolate and rose flavored lemonade (and I typically very much dislike bottled lemonade...) were delicious. Once I get off of low carbing, I'll be picking these up again! What are your favorite goods from the World Market?